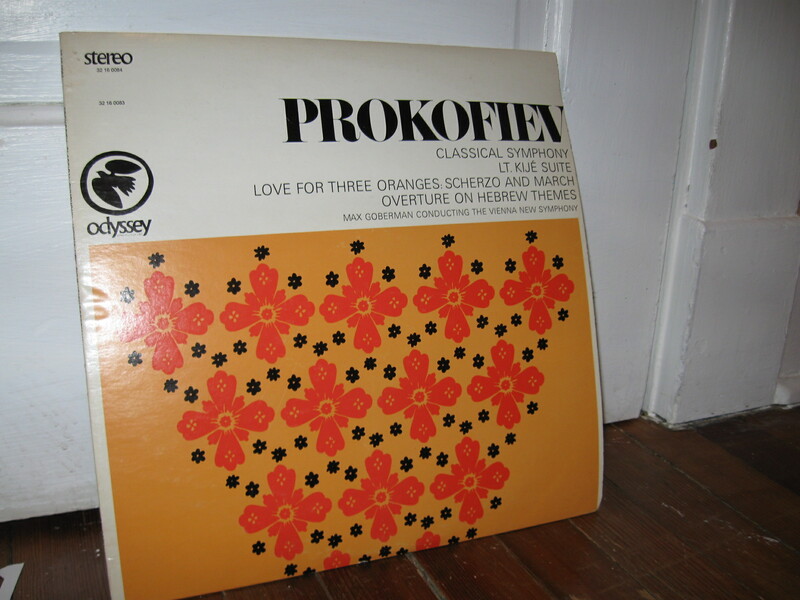 The record I chose tonight was Prokofiev. I bought it for the mandarin orange and butterscotch yellow design on the jacket. I was stirring up spaghetti sauce and classical music seemed like the thing. I didn’t really think about what Prokofiev was. He was, on this record, spanking loud full symphony sawing away. Most of the music I remember from growing up was of the militantly loud variety. My elementary school music teacher played us “Night on Bald Mountain”: Halloween’s Texas-sized demonfest. There are plenty of cymbals and enough drama to intrigue any kid. When I saw the “Fantasia” sequences years later, I thought, how clever of Walt Disney to steal my teacher’s idea! My piano teacher, although a jazzman at heart, taught my mother Rachmaninoff storms. One day, he took my hand to measure my reach, and said, “Oh, you can play this one!” Chopin polonaise. He encouraged me to eat green vegetables to build up my strength. “When you get mad at your boyfriend, you can play this,” he would joke. Alas, I was desperately far from having a boyfriend to be mad at. I descended a steep staircase with a sign that said, “Fallout Shelter,” into a maze of hallways with swiss cheese acoustic tiles. While I waited for my lesson, I zealously read Reader’s Digest, absorbing all the joke bits and trying to remember the funny ones. Then I would pounded my polonaise again. I played violin, too. We played some subtle, quiet pieces, including Barber’s Adagio. It pained me to screech or go hoarse with my bow. There was no room to teeter. It was like walking a tightrope over a snow-white room, your hands black with ink. When we cranked up with the French horns and the big drums, you could slide a little flat or sharp, and be absorbed by the vacillations in the group’s tones. You can see I like the loud stuff because, musically at least, I am lazy and sloppy, but full of enthusiasm. The hairline brushstroke or the held-breath rest can be beautiful. I’m just too impatient to grow the skills, except if you want to talk commas or grammar or spelling. Having patience for the details is always a sign of love, rather than goofy infatuation.